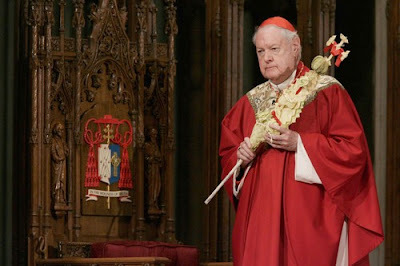 Edward Cardinal Egan was released from Saint Vincent’s Hospital at 2:30 this afternoon, and has returned to his residence behind Saint Patrick’s Cathedral. The Cardinal’s stomach pains had eased sufficiently, and his doctors felt that he should return home to continue to rest and recuperate. No decision has yet been made about the Cardinal’s participation in Holy Week services. Decisions will be made on a day-by-day basis, depending on how he is feeling. Also still to be determined is the date for the implant of a pacemaker. Because this is not an emergency situation, the doctors have allowed for some flexibility in the scheduling of the procedure. In light of Egan's condition, New York's senior vicar-general, Auxiliary Bishop Dennis Sullivan, will stand in to lead tonight's Chrism Mass in St Patrick's Cathedral. 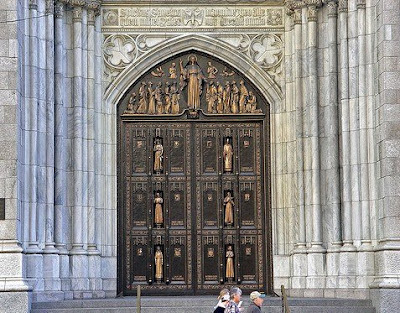 ...and lest anyone forgot, just a reminder that the biggest celebration American Catholicism has seen in a long time begins one week from tonight as the Big Apple's tenth archbishop arrives on Fifth Avenue at dusk, seeking entry into his new charge through these doors.